“Claim: Bananas will be extinct within 10 years. No disrespect to Snopes, but this statement, while not flat wrong, is seriously misleading. Let’s try to sort things out. 1. True, bananas in general aren’t in danger of being expunged from the earth. No one seriously contends otherwise. 2. No one thinks the Cavendish is going to become extinct either. The banana the Cavendish replaced in the 1960s, the Gros Michel (or “Big Mike”), was wiped out commercially by an earlier version of the fungus that now threatens the Cavendish. But the Gros Michel didn’t die out completely and is still grown in some places. The same will no doubt be true of the Cavendish. 3. Nonetheless, absent some miraculous intervention, there’s a high likelihood the Cavendish will be destroyed as a commercial crop. 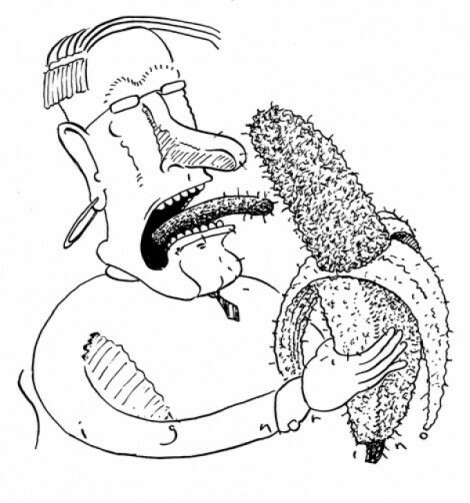 The banana is threatened by Panama disease race 4, a fungus that spreads through the soil. (Panama disease race 1 is what killed off most of the Gros Michels.) There’s no effective way of treating race 4. The fungus is wreaking havoc with the Cavendish industry in parts of Asia, Africa and Australia. So far it hasn’t appeared in the Americas, but it’s transmitted through contact with shoes, clothes, etc., and many scientists think its arrival is only a matter of time. 4. The Cavendish isn’t just “our banana of choice”; in most of the developed world, it’s the only choice. Roughly 100 billion are sold annually. No other variety comes close. 5. Scientists are trying to develop alternative banana varieties that A. are resistant to Panama race 4 and other diseases, B. can be grown commercially and C. people are willing to eat. There are two ways to do this: traditional plant breeding and genetic modification. Although cultivated bananas are sterile hybrids—farmers create new plants from cuttings of the old ones—most produce occasional viable seeds from which a better banana can be bred by and by. However, it’s a slow process. Genetic modification is faster but obnoxious to many consumers. So far, no obvious replacement banana has emerged. If tomorrow the Cavendish were to join the Gros Michel on the compost heap of history, banana growers would surely come up with an alternative, but it might not taste like the bananas you’re used to. 6. Then again, looking at the big picture, who cares what happens to the Cavendish banana? Although it dominates world trade, it’s a so-called dessert banana, prized for its sweetness. Sure, it’s good for you, but in the industrialized world, bananas are an optional commodity, consumed in quantity only since the 1880s. In the developing parts of the globe, different story. Bananas in many countries aren’t dessert; in the starchy form known as the plantain they’re the main course, one of the most valuable food crops on earth. Ugandans, for example, are estimated to spend a third to half their food money on bananas. Those are the bananas everybody should be worried about. Though they’re not going to become extinct either, they’re threatened by a long list of diseases and pests, with names like banana Xanthomonas wilt, burrowing nematodes and black Sigatoka. Black Sigatoka, another fungal infestation, afflicts Cavendish bananas too, but people tend not to worry about it because it can be controlled with fungicides. Trouble is, the fungicides are becoming less and less effective. Banana yields in central Africa are half what they were 30 years ago. Only a handful of scientists are working on the problem. No bananas for us affluent types means we’ll have to find something else to slice up on our cornflakes. For tens of millions in Africa, the potential loss of the banana is a matter of life and death.